Turkish President Recep Tayyip Erdogan said Tuesday that voting 'yes' in next month's referendum on expanding his powers was the best response to what he called a "fascist and cruel" Europe. 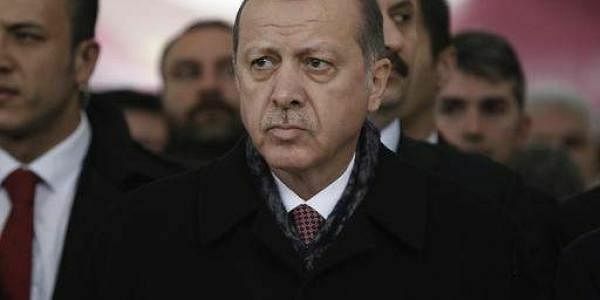 ANKARA: Turkish President Recep Tayyip Erdogan said Tuesday that voting 'yes' in next month's referendum on expanding his powers was the best response to what he called a "fascist and cruel" Europe. "This Europe, like before World War II, is a racist, fascist, cruel Europe... An anti-Islam and anti-Turkish Europe," Erdogan told a rally in Ankara in his latest onslaught against the European Union. "Give such a response, that those watching us on the screen, those watching us abroad, our citizens, all of Europe, all of the world can hear this," he told cheering crowds. The president was speaking ahead of an April 16 vote on whether to approve constitutional changes that will abolish the post of prime minister and could see him stay in power until 2029. The Turkish government argues the changes are necessary for stability but critics fear it will lead to one-man rule. Relations have strained between Europe and Turkey -- especially with Netherlands and Germany -- after Turkish ministers were blocked from speaking with citizens during large gatherings for a 'yes' vote. Ankara repeatedly accused Berlin and The Hague of using "Nazi measures", deeply angering Europe. On Monday, Deputy Prime Minister Numan Kurtulmus defended the jibes, saying the comments were to ensure Europe "does not fall into the trap of fascism". Erdogan showed no sign of let-up in his criticism of German Chancellor Angela Merkel, whom he has accused of "supporting terrorists" and of using "Nazi measures". The president hit out at Merkel's calls for dual Turkish-German national Deniz Yucel, the Turkey correspondent of the German newspaper Die Welt, to be freed. Yucel was jailed last month and is awaiting trial on terror charges. Erdogan, who accused Yucel of being a "terror agent" and taking refuge with German consular officials for a month, said Merkel had asked for him to be allowed to leave Turkey during her February visit. "Our judiciary is independent, the decision will be given by the judiciary," Erdogan said he told the German leader. The crisis is jeopardising Ankara's decades-long bid to join the bloc. But Erdogan swatted away such fears, saying the membership process and the 2016 EU-Turkey deal on stopping the flow of migrants into Europe could not be used against Turkey. "The European Union process, the readmission agreement, this and that, from now on, you can't threaten us with these anymore."